As expected, law firms took almost half of all the spending. While ICANN is required by U.S. law to disclose what it spends lobbying the U.S. government, it is not required to disclose (and doesn't) what it spends "lobbying" foreign governments, and other "influential" persons and entities. Note however, ICANN has spent heavily in support of 'initiatives' outside its scope and mission, not included in the above amounts. In addition, from 1 April to 30 June 2016, an additional $5,000,000 (ICANN estimate) has, or will be incurred, bringing the total to more than $28 million ($US) through the end of June. With CCWG-Accountability Work Stream 2 just now getting underway, and not expected to finish until a year from now, final costs will not be known until sometime next year. If it turns out that the untested, unproven proposals to make ICANN accountable fail, and the world gives up on ICANN, it will have all been in vain. • Also worth noting: as a follow-up to the foreign "lobbying" reference above, ICANN, its directors, officers, and employees, are all subject to the Foreign Corrupt Practices Act (FCPA) (15 U.S.C. § 78dd-1, et seq. ), penalties of which include prison terms of up to 5 years. Since ICANN refuses to disclose foreign lobbying expenses and other influence-peddling expenses outside the U.S., anyone (inside or outside of ICANN), with knowledge of possible violations (past, present, or future) of the Foreign Corrupt Practices Act, should contact the U.S. Department of Justice directly: Report a FCPA Violation via email to FCPA.Fraud@usdoj.gov or via fax 202-514-7021. "“Capture” Through Corruption. Recent events have shown that international organizations ... can be “captured” through corruption. Leading officials of such organizations have pleaded guilty to (or have been indicted for) accepting bribes ... Correspondingly, it is at least imaginable that a government or a private actor could bribe the board of ICANN to vote the way it wishes on some hypothetical critical decision." Or even bribe an ICANN employee for 'insider information' or for 'favorable treatment' on a pending issue. We already know about the revolving door at ICANN and how it corrupts ICANN decision-making. We also already know of at least one high-ranking ICANN officer, who after resigning due to an undisclosed "conflict of interest," went on to serve as Executive Director of the leading new gTLDs domain name industry association, of which former ICANN President and CEO Fadi Chehade admitted: "... this idea of the DNA Association started in some small meetings we were having at the ICANN office where I was a huge early supporter ..." Wouldn't you like to know of all the 'small meetings' at ICANN offices where things are discussed and decided in secret? Among the many things missed by the ICANN Cross-Community Working Groups involved with the IANA transition and ICANN accountability, is the failure of the ICANN Board and ICANN management to have, and enforce, a corporate-wide conflicts of interest and code of ethics or code of conduct policy, applicable to every ICANN employee, not just Board members, officers and a few "key employees." NTIA announcement is an important milestone - but the ICANN-Verisign contract for Root Zone Management is still missing! What's up #ICANN? 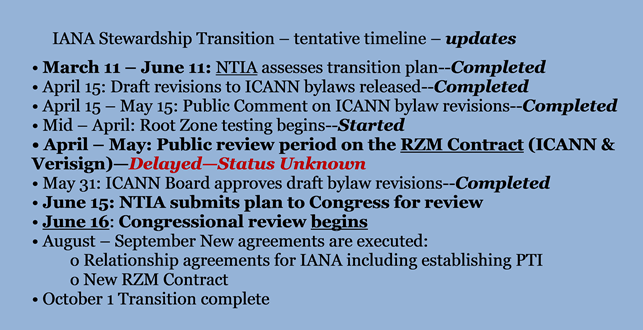 The above chart was derived from Congressional testimony on March 17, and the last we heard from ICANN was May 10th: "Root Zone Maintainer Agreement (RZMA) Status update: Discussions between ICANN and Verisign to finalize details of the RZMA are continuing. The two parties have coalesced around many key elements of the agreement and hope to have a final draft by the end of the month. Once the draft RZMA is finalized it will be made publicly available on icann.org." The "end of the month" has "come and gone" and now more than a month has passed since the last update, and nothing but silence from ICANN to the global multistakeholder community. Verisign was requesting a 10 year extension of its dot COM registry agreement to run coincident with its new 10-year Root Zone Maintainer Agreement. On April 28, 2016, Verisign's Chairman reported "ICANN and VeriSign are in the final stages of preparing the Root Zone Maintainer Agreement and the .COM Registry Agreement extension documents. We continue to make progress and we'll provide periodic updates as appropriate on our progress towards these objectives." If there has been a breakdown in negotiations, no one is talking. • Innovation? That same Mark Monitor report cited above, also discloses "the most frequently registered label [second level] in the [new gTLD] .Brand space is HOME; e.g. HOME.BARCLAYS" but 55% of "home.brand" domain names resolve to a .COM domain name, while 18% are an "inactive page," and only 23% resolve to home.brand content page. Inescapable conclusion: .BRAND new gTLDs are mostly defensive for trademark and branding purposes, but ICANN (at $185,000 + $25,000 annually for each .BRAND new gTLD) is making out like a bandit (while also giving a boost to the registry services industry, the back end operators of each top-level domain or TLD.) It's the kind of shakedown Michael Corleone would have loved. 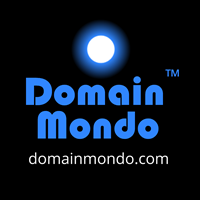 The general trend of redirecting .Brand domains to existing content on legacy gTLDs (.COM) or ccTLDs continues. We’re also seeing more .Brand domains resolving to content by framing, or displaying, content from other sites. While the user experience with framing may be better than a redirect because the .Brand domain remains visible in the address bar, the practice [framing] doesn’t score well with search engines. Search engines view duplicate content as lower quality and therefore the domain won’t rank as well as the domain with the original unframed content. • If you're 'selling' dot COM domains to Chinese buyers, read this post by someone who really knows and understands the Chinese market: Finding Chinese companies for your .com name | coreile.com: "... We know .com is king in China and therefore is frequently the target of domain upgrade by Chinese companies ..."
• ICANN has announced "the implementation of amendments to the [Domain Name] Transfer Policy and the Transfer Dispute Resolution Policy (TDRP). The amended Transfer Policy is applicable to all gTLD names and ICANN-accredited registrars. The amended TDRP is applicable to all gTLD names, ICANN-accredited registrars, and registries. These new requirements will take effect and will be enforced by ICANN beginning on 1 December 2016." "Since the ICANN 33 meeting in Cairo, supported travelers per ICANN meeting have increased over 325% and out of pocket travel costs have increased 250% ... during that time the organization has not examined those increases in a structured way. In view of the expansion of travel support for the last several years and expected changes prompted by the potential IANA Stewardship Transition implementation, the organization intends - in partnership with the community - to conduct a thorough examination of community supported travel in FY17 so that more strategic consideration can be given to levels of travel support among all community activities and groups across the organization." • No issues open for comments close this coming week at ICANN. • Internet Governance Forum (IGF) news: IGF Retreat 2016 Call for Written Inputs: "All stakeholders are invited to send written inputs commenting on issues that will be discussed" at the IGF Retreat (July 14-16, 2016). The guiding questions (based on the the draft agenda) may be reviewed, and responded to, here. The deadline for responding is July 1. Yahoo bidders can’t even agree on what they’re buying | Recode.net: "A clearly failing business" says one bidder. It's a mess--someone please help Marissa Mayer liquidate $YHOO assets--the longer this drags on, the worse it gets. 'It's Over'--first the internet, now apps--The app boom is over | Recode.net: "... If you are an independent app developer or publisher, you have probably known this for a while, because you have found it very difficult to get people to download your app — the average American smartphone user downloads zero apps per month ... Last month, the top 15 app publishers saw downloads drop an average of 20 percent in the U.S., according to research from Nomura, which relies on data from app tracker SensorTower ... Outside the U.S., the top 15 apps grew by [only] 3 percent last month..."
Ex-iPhone Users in China | ChinaInternetWatch.com: Penguin Intelligence, part of Tencent, recently conducted a survey on iPhone losing users in China. Over one-third of China smartphone users would replace smartphones for new ones at least once a year and over three-quarters of Chinese would do so every two years according to the survey. Among iPhone users surveyed, almost half gave up using an iPhone and Huawei is their top replacement choice. Rethinking a business model: New York Times 'Exploring' Ad-Free Digital Subscription | AdAge.com: "CEO Mark Thompson, at IAB Conference, Criticizes Eyeo and Adblock Plus"
The Distraction of Investment Noise | Bloomberg.com: "Deciding what to focus on -- and how much attention or weight to give to these issues and events -- is a challenge for traders and investors alike." Free speech isn't free: Dozens in Russia imprisoned for social media likes, reposts | AP.org and ICYMI: http://safeinternetforum.ru/en/ Russia discussed with China internet management issues, including China’s Internet sovereignty model and content control of the internet during the 7th International Safer Internet Forum, April 27, 2016, in Moscow. An opening address was given by Lu Wei, "Head of General Office of the CPC Central Committee’s Central Leading Group for Internet Security and Informatization." See also The Best and Worst Internet Experience in the World | technologyreview.com: "The system today [in China] has largely shifted from censoring individual news stories to shutting out entire services or platforms." and China's government must pre-approve every single mobile game starting July 1 | techinasia.com. Is the Market Rational After All? | charleshughsmith.blogspot.com: "This is the market we have now: dominated by delusional, irrational central planners with unlimited powers to create money out of thin air to fund their manipulations. The only rational response is to trade accordingly: anticipate constant manipulation, anticipate constant bombastic propaganda of the "whatever it takes" variety, and anticipate massive selling of volatility to maintain the ever-so-important illusion that global risks have been disappeared by central banks and central planners." What if the U.S. Dismantled China’s Internet Firewall? | FPIF.org: "The U.S. could retaliate against a massive Chinese cyberattack by blowing up its web censorship ..." But read: The Pentagon's Cybersecurity Priorities Have Not Changed in a Decade | Motherboard.vice.com: "At present, Cybercom is a component of Strategic Command, but its top official is the head of the National Security Agency—arguably a needlessly complicated arrangement. The nebulous command structure also means that Cyber Command never really has to own up to its own failings." Brexit may be just the beginning: “The Specter of a Break-up Is Haunting Europe” | WolfStreet.com: "... it’s perhaps no surprise that senior eurocrats are falling into despondency, despair, and internal bickering ..." Note: Brexit vote is June 23. Read We Were Wrong About Gravity… What Do We Have Wrong Today? | LitHub.com. I suggest turning off the noise and distractions of U.S. Presidential politics. I've told @UnderMyPalm to be prepared to wrap it up (the Election2016 page), if, and when, Bernie drops out, leaving only 2 candidates, each with very high unfavorables, vying for the nation's top elected office. And frankly, the mainstream media have become the worst enablers and PR flacks this year. It's all become such a circus, I don't want to watch, and I have better things to do. I hope you do too.